1Ste provincial La Souterraine 1018 old birds. Hok Demely Liliane from Moorsele , consisting of Filip Vanneste, wife Liliane and son David Vanneste, is a rock-solid season! Each year exploits these colony there in one or more provincial victories to pick up, in 2014 This is no different! The colony was originally founded by Gerard Vanneste, the grandfather of David Vanneste and father of Filip. After the death of Father Gerard Vanneste, the pigeons total sold. It was 1988 and it was one of the best auctions of the eighties. 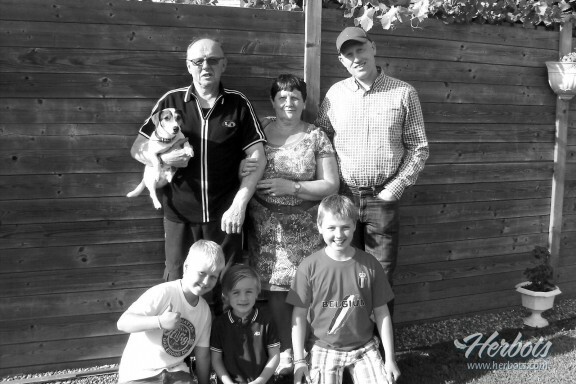 Son Filip, moved in 1989 to Moorsele and began in 1990 to play again with the pigeons, together with his wife Liliane and son David. Filip and David who are busy running a family business in interior design, Therefore, Liliane de pigeons under her wing and one plays also under her name. Successful input with the Rad-pigeons! 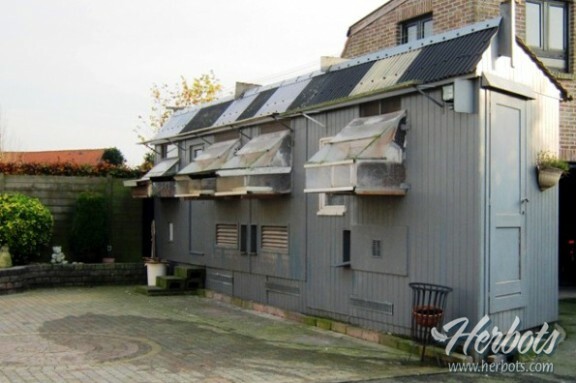 In 1989 pigeons were procured from the strongest milkers from the province of West-Flanders. With success because from these investments came top pigeons on as the "Jacko" and descendants of the "Jacko". Pigeons that could win a 1st provincial, but the offspring brought no longer results as before, There was decided to again reinforcement at retrieve ... One of the best players at that time was John Rabe from Passendale. Filip & David had already hear a lot about his super pigeon the "Gale". Long was not doubted and there were immediately boy ordered straight from the "Gale" x "Wendy" as well as from 2 sons of the "Gale". The boy of the third round were in 1996. From these pigeons were 6 boy bred and immediately there was a hen at that very good flew as young, and super as a yearling and old pigeon with 8 first prizes as a result. This came from "grandson Gale" x "Daughter Gale" . Because it is so good I really couldn't with the Rad-pigeons, are they something go dragging in every year since then from the toppers of Loft Race. In 2000 came o. (a). a son of the "Flash" x "Wendy". 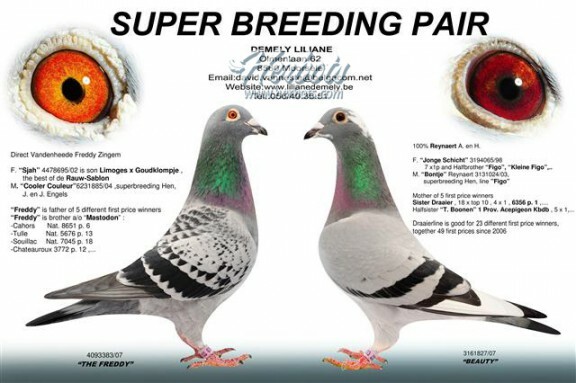 The "Flash" is a phenomenal grower and is father of 3 Provincial ACE birds including the Favori (12 x 1st prize) – Emperor ( 14 x 1st prize) – Figo (16 x 1st prize and 1. Wet. Bourges) and also father of the "Small Figo" by Baloch which in turn father of the Cannibal and Church Dove (1 Wet. Le Mans by more than 120000 (d).) With the family Race came into existence over the years a close bond of friendship. On the breeding loft homes currently 5 grandsons of the "Figo", 5 granddaughters of the "Gale". You can say that the pigeon file consists of 70 % Rad – pigeons. 3024307 BE13-also called "Freddie" called: 1Ste Provincial Chateaudun 3.101 d.
Father: B06-3054630, “Sultan Bakhsh ": Super pigeon which was awarded to 1. Prov. Ace Pigeon KBDB 2007 Yearlings. He flew o. (a). 5 x 1st prize and 10 times top 5. Is a descendant of the Flash-Figo line of Rad (A). and H. from Passendale . Grandfather: BE00-3277207, "Son Flash": a son from the super couple "Flash" x "Wendy". The "son Flash" is brother of the 1st Prov. 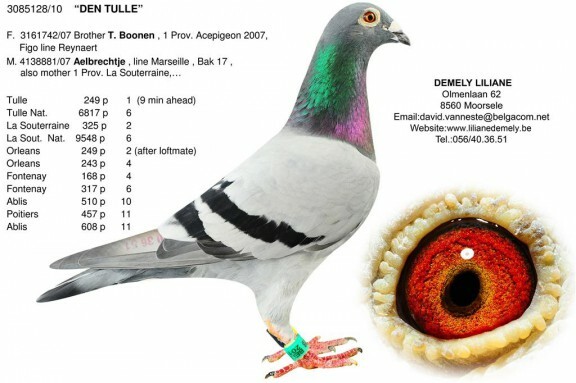 ACE pigeon: the "' Favori ' with twelve first prizes and half brother of three other provincial ACE birds including the" Super crack ", the "Emperor" and the "Figo". He is also the half-brother of "Small Figo", who is the father of the supers ' Cannibal ', the "Church dove ' and many other toppers. Grandmother: Be03-3131024, "Bakshi Rad": Matriarch of the Loft! Mother of. "Sultan Bakhsh" and "Driver". Mother: Be10-3085151, "Sister Hazard": sister of "Hazard" which 5 x 1st prize won. Grandfather: Be06-3054670, "Driver": flew itself 4 x 1st prize and 18 x Top-10, is also a very good breeder and. all father more than 20 x 1st prize kites! Chateaudun Lok 1st against 267 d.
Prov. 1Ste and 3.101 d.
Arras Lok 4th against 72d. Fontenay Lok. 5the against 211d. Clermont Lok. 6the against 219d. Clermont Lok. 16the against 319d. Fontenay Lok. 9the against 100 d.
Pontoise Lok. 13the against 709d. Orleans Lok. 25Ste at 425d. Be10-3085128 also called "Den Tulle" called: 1Ste 1018d provincial La Souterraine. A few weeks after the provincial victory of "Mike" was again bingo! This time it was a half-brother of "Josephine", that brought home the palm. This pigeon was not and already has a great palmares flown together! Mother: BE07-4138881, "Aelbrechtje": direct Marcel Aelbrecht, Lebbeke. She is a crossing of the success lines Marseille x Fine Blue x Bake 17. Already mother of 1. Prov. La Souterraine, 2. Prov. St. Junien (3. s-NAT.) , 9. Prov. Gueret. N. Zone 5th against 2,460 d.
Wet. 6the against 6.817 d.
La Sout. Lok. 2the against 325 d.
Wet. 6the against 9.548 d.
Fontenay Lok. 4the against 168 d battery Tester. Orleans Lok. 4the against 243d. Clermont Lok. 5the against 128 d.
Fontenay Lok. 6the against 317d. Ablis Lok. 10the against 510d. Orleans Lok. 10the against 226d. 2008 : 21 x 1 and among other things 1 Prov. Tours,…. 2009 : 19 x 1 and among other things 1 Prov. Limoges,…. and 1 Prov. La Souterraine,…. 2 Prov. 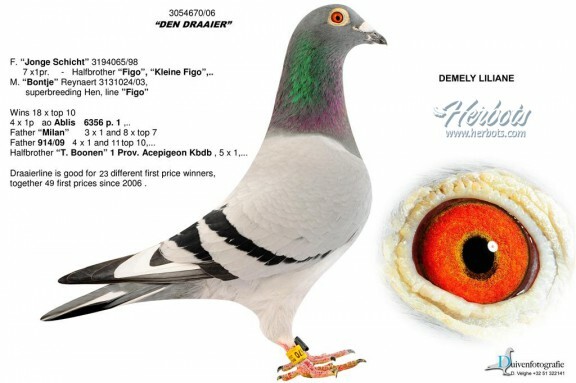 Ace Pigeon Kbdb , Best Yearling by w.-Vl. on the Kl. H. F.
As well as 8 Wet. Poitiers 14.094 yearlings,….